It was a Friday night and the restaurant was packed! We didn’t sit at the bar this time. Ever since Michelle and I went to Tsujita LA last month, I became very drawn to the idea of dipping noodles. Summer time is here and I’m sure a bowl of steaming broth in your face in hot weather would not make ramen eating a pleasant experience. Tsukemen would be a great solution to ramen deprivation I might have placed upon myself because of 100 degree weather. We ordered some gyozas to start and Michelle had a salad. She ordered her usual Red Ramen and I ordered their tsukemen. 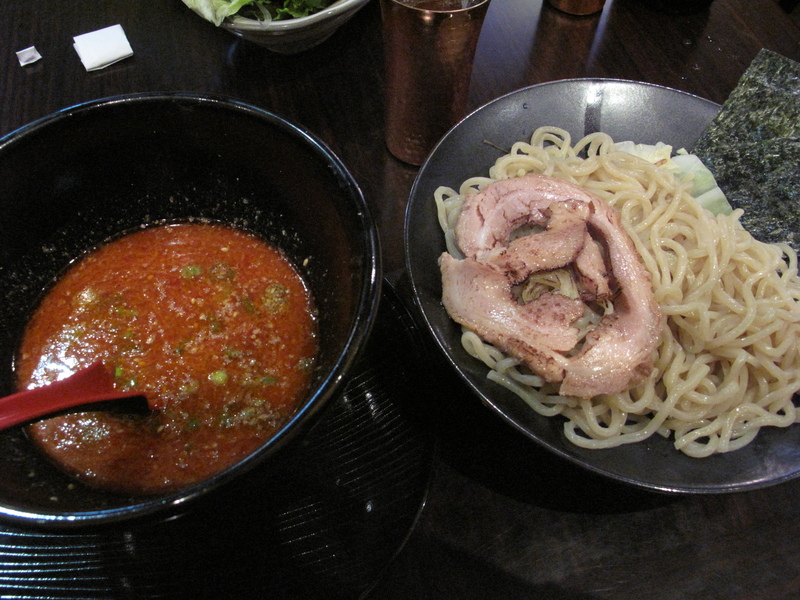 You can order the tsukemen in the normal or large size, for the amount of noodles. The broth had a sweet and spicy flavor but it was a bit on the saltier side. But overall, it was tasty! The noodles are much thicker than what they use in their ramen but they had the usual toppings; chashu, cabbage, nori and menma (which I asked to not to include.) I also ordered their soft-boiled egg. I wish I had ordered the large side of noodles because I wanted to use up all the broth I had left over and I was still hungry. So I ordered some takoyaki and the person that I’m assuming is the head chef, cooked them and brought them to me. He was very nice and sweet! We chatted a bit about how he grew up in Japan and that he noticed I came to his restaurant pretty often. Anyway, I enjoyed my tsukemen and eager to try them at other places. I might go back to Tsujita Annex since I hear they serve tsukemen now. But don’t worry Kotoya, you’re still my number one ramen joint! This entry was posted in Japanese, Kotoya, Ramen, Ramen Run, Restaurant Review, Santa Monica and tagged Japan, Kotoya, Los Angeles, Noodle, Ramen, Tsukemen. Bookmark the permalink.